I am all about healthy, easy meals and this is one that I made up the other day and everyone in the family enjoyed it. I typically cook, organic, non-gmo and gluten free but you can make this with wheat noodles or whatever ingredients you prefer. This should take about 30 minutes to prepare and cook. 2 C chicken, cook and cut into bite size pieces (I used an organic rotisserie I bought at the store for this but you could use 2 chicken breasts as well). To start you are going to get 2 medium pots. The first one is going to be for your broth and the second one is going to be for your noodles. Grab pot 1 and put it on the stove, turn to med/high heat. Add oil and the chopped onion and cook for 1-2 minutes. Add garlic and ginger and toss. Cook an additional 1-2 minutes until it all starts to get slightly golden brown. Add the turmeric, sea salt and carrot and toss to coat. Add the Braggs and allow to simmer for about 5 minutes until carrots are softened but not cooked through. Add the cooked chicken and peas and the broth. Bring to a boil then reduce to a simmer and let cook for 15-20 minutes. While this is cooking grab pot 2 and put enough water to cook the ramen cakes - usually about 3-4 cups. Bring to a boil. Carefully place the ramen "cakes" into the pot and cook to instructions. The ones I used took 4 minutes total. Once cooked through remove from heat and toss into a colander and rinse with cold water. 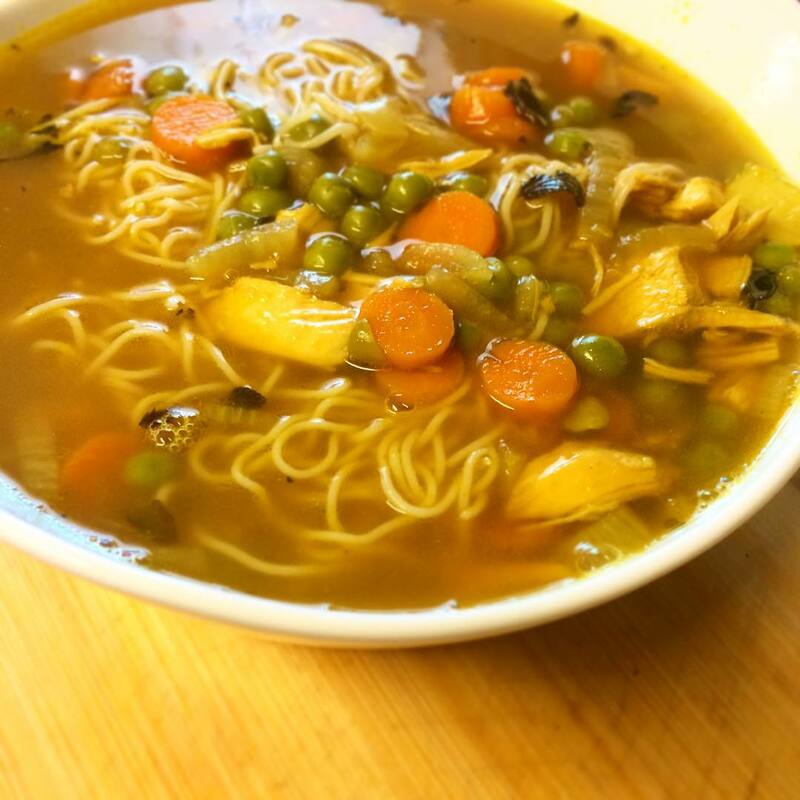 Now that it's all cooked grab a big soup bowl, add the cooked Ramen noodles and ladle the chicken and vegetable broth on top. Careful it's hot! Serve and enjoy!!! side note: If you have any leftover make sure to store the noodles separate from the broth; the noodles will absorb all the liquid if left in. Know Mommy is dedicated to sharing knowledge and experiences about breastfeeding, natural birth, cooking and being a Mom as well as teaching families to empower themselves by making natural choices in their daily lives. I am a Mother of two boys, lover of food/hesitant chef, home birthing, nature loving, Natural Solutions wellness Advocate and Artist. I believe there are many choices in life and knowledge is key to unlocking them.